I don't even remember who requested Frau. Sorry it took so long. 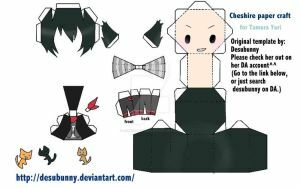 Parts were recolored from (DesuBunny's) various papercrafts. 07Ghost (c) Yuki Amemiya and Yukino Ichihara. This recolored model (c) me. The parts from this recolored model (c) DesuBunny. - Uhh, he's smiling because I made his craft before I watched the anime. I didn't know that he was such an unhappy person. Pair him with Teito so they can be happy together. - Glue his hair parts onto the inside of his head before closing his head. The smallest hair piece goes on the his left/your right. - To make his scythe, cut out both pieces and glue them together, white side to white side. - To give him his scythe, just cut a small slit on one of his arms and use a toothpick to apply a little glue between, above, and below the slit. Insert the scythe, and hold for a while or until it holds by itself. - To make that rectangular piece that's supposed to be his coat collar... Fold ONLY along the black lines. You must glue this piece on the bottom of his head so the squares on both his head and the piece are aligned. On the square of this rectangular piece, you can glue his body. If you want to print the pattern out, you can copy and paste the downloaded image onto Microsoft Word (or a writing program) and make the image larger. solo hay tres plantillas de 07 ghost?